Firstie? How fun! beautiful picture composition - our goats would love to chomp some of that iced vegetation. They aren't keen on haysicles! Ice storm around this part of Texas today. Sorry about Lindy the Chicken - she was a sassy lil hen (No Jeff - not SAUCY - although sweet and sour -- Oops - definitely shouldn't go there) We also grieve over losses of our critters - they are so much a part of country life. Each has a personality and spot to fill - trusting Whitey will find an appropriate perch pal. I should go back to the Parrotlets website and copy the piece anonymously written called, "Just a bird." Somehow I think that you already know the essence of it, since you had Lindy, who was "just a hen." We do tend to become dependent on our animals, to love them, and need their love in return. I am sorry about Lindy, but I do know that she had a life that any chicken would trade for! Go for writing those children's books. I'd love to help you promote! Oh how lovely! 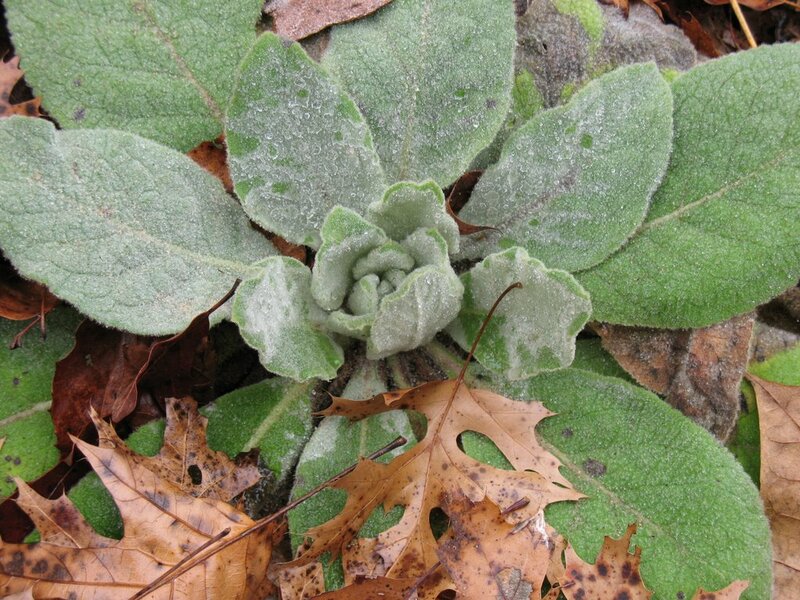 I had to google mullein...worth keeping around for coughs and sore throats, or if you need to chase away evil spirits. Looks like lamb's ear to me. Related? Mullein was also used by our industrious pioneering women to redden their cheeks. It feels slightly prickly when rubbed in a circular pattern on the cheekbones, but does leave a lovely glow...had to try it once I'd heard about nature's make-up! The early North Americans used to dry and smoke it(as in ciggie) for medicinal reasons I'm sure! Saw your "year ago" picture, which reminds me, you haven't revealed to us the llamas' name yet. I'm sure you'll be getting to it "soon" (I am all too familiar with how "soon" works for my own stuff too). Just thought I'd throw a little reminder out that we are still waiting with baited breath. Kill all mullein. I am trying to eradicate the stuff at Roundrock. Not much chance of that, but a fellow has to have something to keep him out of trouble. Thinking of you and yours on this Friday morning, hoping all is well, you are likely in the path of that big storm, hope your power is holding, and all is okay! I really hope you guys didn't get froze solid in that storm. The news made it look very bad.